Pakistani-American has been elected mayor of a town in Washington state by a landslide. The 54-year-old Mayor-elect Haroon Saleem admits that running the Timberline Bar and Cafe, with beer ads plastered everywhere, is not exactly a pious following of Islam, which forbids alcohol consumption. The big win for a Muslim Pakistani-American is all the more surprising because Granite Falls is a small mining town of 800 mostly blue-collar whites, a result that residents say would have been inconceivable not long ago. After 911 attacks in New York and Washington, Saleem told the Associated Press that community members reached out, letting him know he was one of them. No one seems to notice that his wife, Bushra, attends social events wearing a traditional shalwar-kamiz. While Saleem is only the second American mayor of Pakistani origin after Dr. M. Ali Chaudry of New Jersey town of Basking Ridge elected in 2001, others have been elected to public offices in different parts of the country. Masroor Javed Khan, a fellow NEDian and a friend, serves on the city council in Houston, Texas. Saghir Tahir is a member of the New Hampshire State Assembly. Saqib Ali is a legislator in Maryland State. 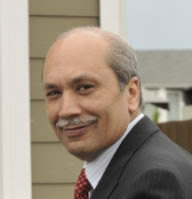 Since the growth of immigration from Pakistan and other non-European nations starting in 1965, the Pakistani American community has not been particularly politically active, but this is now changing, with the community starting to contribute funds to their candidates of choice in both parties, and running for elected office in districts with large Pakistani American populations. In recent times, Pakistani American candidates have run for various offices across the nation. Because the community is geographically dispersed, the formation of influential voting blocs has not generally been possible, making it difficult to for the community to make an impact on politics in this particular way. However, there are increasing efforts on the part of community leaders to ensure voter registration and political participation. The U.S. Census Bureau has indicated that there are about 210,000 U.S. citizens of Pakistani descent living in the United States, including permanent residents. The Census Bureau, however, excluded the population living in institutions, college dormitories, and other group quarters from all population groups. The Pakistani embassy estimates the number of people of Pakistani origin living in United States to be much higher, closer to 500,000. According to estimates published by the Wikipedia, 50% of Pakistani Americans have origins in the Punjab Province of Pakistan. About 30% are Urdu-speaking "Muhajirs" and the rest is made up of other ethnic Groups from Pakistan. The most systematic study of the demography of Pakistanis in America is found in Prof. Adil Najam's book 'Portrait of a Giving Community' (Harvard University Press, 2006), which estimates a total of around 500,000 Pakistanis in America with the largest concentrations in New York and New Jersey states, each with around 100,000 Pakistani-Americans. Based on my own knowledge and experience of living in California for decades, the estimate of $49,0000 median household income of Pakistani-Americans appears to be too outdated and too low, particularly for the San Francisco Bay Area where I conservatively estimate it to be higher than $100,000. Unlike California, New York City’s Pakistani Americans are mostly newer and less-educated immigrants. They tend to experience greater poverty, earn less, speak less English and live in larger households than city residents as a whole in 2000, according to a census analysis by the Asian American Federation of New York. 1.From 1990 to 2000, New York City’s Pakistani American population grew from 13,501 to 34,310, or 154 percent – surpassing increases of 9 percent for the city overall and 71 percent for all Asian New Yorkers. 2. More than one-third (34 percent) of Pakistani American children and more than one-fourth (28 percent) of all Pakistanis in New York City lived in poverty – exceeding 30 percent of all children and 21 percent of all residents in the city. 3. Pakistani New Yorkers’ per capita income was $11,992 – about half of the city-wide figure ($22,402). 4. Two out of 3 elderly Pakistani Americans (67 percent) and nearly half (48 percent) of all Pakistani adults in New York City had “Limited English Proficiency” – markedly surpassing 27 percent of all elderly New Yorkers and 24 percent of all city adults. 5. New York City’s Pakistani American households averaged 4.1 occupants – far more than 2.6 city-wide. 6. Almost one-third (32 percent) of Pakistani American adults in New York City had not finished high school – compared with 28 percent of all adult New Yorkers. 7. With a 79 percent foreign-born population, New York City’s Pakistani Americans were more than twice as likely to be immigrants as city residents overall, of whom 36 percent were born outside the United States. 8. Most Pakistani Americans in the city lived in Queens, with 45 percent of Pakistani New Yorkers (15,604 people), or Brooklyn, with 41 percent (14,221). The rest of the city’s Pakistani population was distributed about evenly among the Bronx, Manhattan and Staten Island. According to the New York Times, the stretch of Devon Avenue in North Chicago also named for Muhammad Ali Jinnah, the founder of Pakistan, seems as if it has been transplanted directly from that country. The shops are packed with traditional wedding finery, and the spice mix in the restaurants’ kebabs is just right. The 2000 federal census counted over 18,000 Pakistanis in metropolitan Chicago, one of the largest concentrations of Pakistanis in the United States. According to the Encyclopedia of Chicago, community estimates in the late 1990s, however, ranged from 80,000 to 100,000, most of whom were either Urdu- or Punjabi-speaking Muslims. Like other South Asians, Pakistanis have commonly tended to settle in and around major urban areas, especially on the two coasts near New York and Los Angeles. Chicago and other inland cities such as Houston have also developed large and visible Pakistani communities. Nationwide, Pakistanis appear to be prospering. The census calculated that mean household income in the United States in 2002 was $57,852 annually, while that for Asian households, which includes Pakistanis, was $70,047. By contrast, about one-fifth of young British-born Muslims are jobless, and many subsist on welfare. Pakistani-Americans political participation remains woefully inadequate. But it's good to see some signs that it is starting to happen at various levels starting from from local communities to state legislatures. Rams owners Chip Rosenbloom and Lucia Rodriguez have entered into a signed agreement to sell the team to Shahid Khan, multiple NFL sources told the Post-Dispatch late Wednesday night. Khan, 55, is the president of Flex-N-Gate Corp., an auto-parts manufacturer based in Urbana, Ill. Khan has lived in the Champaign-Urbana area for more than 40 years and is married with two adult children. Khan is a graduate of the School of Mechanical and Industrial Engineering at the University of Illinois. According to league sources, Khan will purchase the 60 percent of the team owned by siblings Rosenbloom and Rodriguez, who inherited the franchise from their late mother, Georgia Frontiere, in early 2008. NFL owners must approve the sale. Over 50,000 Pakistanis have immigrated to the United States in the last 5 years, making Pakistanis ineligible fir the diversity visa lottery. This year, the entry period for the lottery lasts for 30 days, from October 5 to November 3. The lottery is open to individuals who meet certain education or work requirements and were born in an eligible country. Those whose names are selected by computerized random drawing are permitted to take the next steps in the visa application process. “The idea was to diversify the immigrant pool,” said John Wilcock, a visa specialist with the State Department, in explaining the 1990 law that created the new class of “diversity immigrants.” He briefed journalists at Washington’s Foreign Press Center September 27. The Diversity Visa Lottery is open to natives of countries that have sent fewer than 50,000 immigrants to the United States in the last five years. Countries that are the source of high numbers of immigrants are excluded from the lottery. The ineligible countries are the same as last year: Brazil, Canada, China (mainland-born), Colombia, Dominican Republic, Ecuador, El Salvador, Guatemala, Haiti, India, Jamaica, Mexico, Pakistan, Peru, the Philippines, Poland, South Korea, United Kingdom (except Northern Ireland) and its dependent territories, and Vietnam. People born in the Hong Kong Special Administrative Region (SAR) of China, Macau SAR and Taiwan are eligible. To ensure that 50,000 permanent resident visas are issued each year, Wilcock said, some additional names are selected in the lottery to make up for people who decide not to apply for a visa or don’t qualify. Pakistan has contributed approximately 10,000 international medical graduates (IMGs) to the United States,1 even though it faces a shortage of physicians.2 Take the case of Aga Khan University Medical College in Karachi. By 2004, it had produced 1100 graduates, 900 of whom had gone on to graduate medical training in the United States — . . .
Then, as a couple of local officials he knows catch up by the window, and a former state police officer he knows picks up a frozen cake, and a Mennonite family, regular customers, eat his soft-serve out on the patio, Hamid from the Dairy Queen tells his American story. He was the youngest of six in a Muslim family in Karachi. His father, an accountant, was physically and mentally damaged after being hit by a car; his mother, a schoolteacher, took care of her husband and insisted that her baby go to America for a better life. That meant Chicago, where a brother was driving a cab while studying to become a college professor. Mr. Chaudhry took several years to earn a college degree in finance, partly because of language difficulties, and partly because he was always working — mostly at the celebrated Drake Hotel. He was the unseen busboy, working his way up to assistant manager for room service and minibars, serving Caesar salad to President-elect Bill Clinton, delivering unsatisfactory apple pancakes to Jack Nicholson, tending to the dietary needs of a guest named Lassie. The Drake became an immersion course in Western pop culture. He became an American citizen and started a career in financial-accounting software, eventually moving to New York, where he got fired. (“Wall Street wasn’t for me,” he says.) But he did meet a medical student named Sana Syed. Their first meeting was with her parents; the second was for a coffee at Starbucks; the third a brunch at a diner; and, finally, a dinner date at an Outback Steakhouse. After they married in 2001, she landed a residency at the Reading Hospital and Medical Center. While his wife worked 90 hours a week, Mr. Chaudhry mustered the nerve to ask the owner of the local Dairy Queen, at Kenhorst Plaza, whether he wanted to sell. When he heard yes, Mr. Chaudhry scraped, mortgaged and borrowed to meet the asking price of $413,000. He completed his classroom training at Dairy Queen’s headquarters in Minnesota, where he studied everything from labor management to the proper way to hand a customer a Blizzard. On June 27, 2003, he finally opened the doors to his Dairy Queen, but he was so jittery, intent on making every customer feel extra, extra special, that one employee quit on the spot. Oh, and the soft-serve machine malfunctioned. Once he found his footing, Mr. Chaudhry decided to give back to the community, and held an elementary-school fund-raiser in which he provided the parent-teacher organization with 25 percent of the sales. Though the $450 seemed a generous amount, the publicity he received did not seem right to him. “It felt like I got more in return than what I was giving,” he says. Just like that, the Dairy Queen began to become the center of communal good, notwithstanding its contribution to the high obesity rate recorded among adults in Berks County. Mr. Chaudhry immersed himself in fund-raising, splitting everything 50-50 so that he only covered his costs. Good for promoting the business, yes, but also good for Hamid. Fund-raisers for a father of four with cancer; for the Children’s Miracle Network; for soccer teams and Little League teams and the widow of a deputy sheriff recently killed in a shootout — he was a regular customer who liked Blizzards. Sponsorship of car washes and high school homecomings and blood drives four times a year. (Donate a pint of blood and get a $20 frozen cake.) Free parties held at every local elementary school, as well as at a Bible school run by the Mennonite church. While there is nothing wrong with being a taxi driver, all this bigoted talk by presumably Indian commentators(sent to me but not posted) about most of the taxi drivers in America being Pakistani is just nonsense as confirmed by the NY Times data. It shows that there are 16000 Indian taxi drivers in America versus 10,000 Pakistan taxi drivers. I see that most taxi drivers, 711 workers, gas station attendants, liquor store clerks and newsstand sellers in the United States are Indian....and it's not surprising given that there are a large number of legal and illegal Indian immigrants in US. 2. Pakistani-American population doubled from 2000 to 2010, the second largest percentage increase after Bangladeshis' 157% increase in the same period. 4. 65% of Pakistanis in America are foreign-born. 57% of Pakistani-American population is naturalized citizens. 6. There were 69,202 immigrant visas issued to Pakistanis from 2001 to 2010. 8. Average per capita income of Pakistani-Americans is $24,663.00 and 15% of them are classified as poor. 9. 55% of Pakistanis own their own homes. 10. 55% of Pakistanis have bachelor's degree or higher. This charming, droopy city needed new fire trucks not long ago, but, like many American municipalities today, couldn’t necessarily afford them. The mayor, a small-government Republican, dithered: to buy or not to buy? He turned to the natural choice for advice on running a Texan city: Pervez Musharraf, the exiled ex-president of Pakistan. Mr. Musharraf may seem an unlikely adviser to the mayor of a Southern town where crickets chirp shrilly and the leafy streets are dominated by places pledging to fix your truck. But even more unlikely is the man he advised: Mayor Arjumand Hashmi, a Pakistani-born cardiologist who has become one of the United States’ most improbable politicians. He is like the opening line of a joke: “So a Texan, a Muslim, a Republican, a doctor and the mayor of Paris are sitting at a bar ...” Except that he is, by himself, all of the people in the joke. The mayor swept into office with an immigrant’s zeal: planting hundreds of crepe myrtle trees on the loop around the city; surprising local agencies with impromptu visits during his lunch hour; interrupting the “brother-in-law deals,” as they’re called in the South, that gave contracts to the wrong people; using tax abatements to lure businesses to Paris. All this while serving as a cardiologist and leader of a local hospital catheterization laboratory that is often the only thing standing between the chicken-fried steaks that patients keep on eating and the deaths they nonetheless wish to defer. Which is why Dr. Hashmi, who is in his early 50s, wakes up at 3:30 a.m. most days. He prays the first of his customary three daily prayers. (He maxes out to the prescribed five when he can, but says he’s pretty sure Allah wouldn’t want him stopping to pray when he’s got a catheter up someone’s groin.) Then he alternates throughout the day between doctor and mayor, doctor and mayor. U.S. politicians are wont to conceal the complexity and worldliness in their backgrounds — as with Mitt Romney’s ability to speak French or President Barack Obama’s early years in Indonesia. Dr. Hashmi takes a different approach, speaking Urdu to friends or family in front of his colleagues, answering the phones with “Salaam aleikum” at times and at times with “How ya doin’?” His Pakistani accent remains strong. Just after 11 p.m. that same night, after a full day’s work twice over, he was sitting on a sofa at home with his family and some friends, nibbling on flaky cookies specially bought in Lahore. His beeper sounded. A middle-aged man was at the hospital with chest pains, and the emergency room doctor wanted his advice. He asked for an electrocardiogram to be texted to his iPhone. When he saw it, he concluded that the man needed him. He told the doctor to prepare the catheter, and he drove away down a dark country road into his Paris. AUSTRALIA: A Pakistan-born migrant Mehreen Faruqi became the first Muslim woman to enter the Australian state parliament as she was selected by the New South Wales Greens to fill a position in the upper house of the state legislature, Voice of America (VOA) reported on Wednesday. Faruqi was selected by a postal ballot of party members, from a field of seven in a contest in which only women could run. She is all set to become part of Australia’s first and oldest parliament in New South Wales in July as the first female Muslim in any of Australia’s state, territory or federal parliaments. While Muslim groups worry that Faruqi will face problem in merging the teachings of Islam and Greens policies, she believes that faith should have no bearing on Australian politics. “I see no role that religion plays in government and nor should it. I am not a spokesperson, you know, for religious Islam. There are many other MPs who are Christians and likewise they are not spokespeople for the church,” she stated. “She would support things such as gay marriage and that is directly in conflict with the teachings of Islam. I do not know whether she is going to stick to that, how she is going to harmonize between the two,” Keysar Trad, the founder of the Islamic Friendship Association of Australia said. Faruqi studied environmental engineering after she migrated from Pakistan with her family in 1992 and is a professor at the Australian Graduate School of Management at the University of New South Wales. As the ethnic diversity increases in Australia, analysts expect more participation from minorities in the political arena.